Enjoying Christmas through your kid’s eyes is one of the greatest joys of the season. If you have a curious child in your house, Christmas trimmings become ten times more complicated. Keep the viewpoint of your little one in mind while decorating for Christmas. It will help you to avoid unintentional hazards. Try to use unbreakable ornaments for the decoration of Christmas tree instead of glass ornaments. When a glass ornaments breaks it spreads into millions of pieces and it is impossible to find each and every piece. If you are using glass ornaments then you should keep them at the top of the tree to keep them away from kids reach. 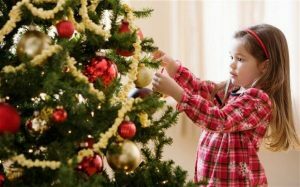 Use extra tie down to Christmas tree to make it baby safe to prevent from tip over hazards. You can also use bricks or other heavy material to weigh down your tree stand. If you are using artificial Christmas tree than make sure that it is fire rated and if you opt for a real one, make sure that it is fresh. Kids are mostly attracted towards wires. To block kids to access wires, cover them with wire covers or minimize the strands hanging all around the house. If you are using resistant stuffs for decoration, you have to hang them. Avoid using the hooks as they can pose a serious choking risk. In place of hooks, you can use ribbons to prevent risks. During the time of festivals, lights are one of the main decoration items. So make sure that you have used plastic covers on all unused electrical outlets and never leave your baby all alone near the tree or holiday decorations. Put the decoration material on the table or hang up around the house to keep your kids away from them. Not only will it help to keep kids away but also it will help to make cleaning easier before and after those inevitable holiday gatherings. You should vacuum immediately after finishing the whole decoration of the tree to avoid any craziness like kids eating a Christmas bell or small ornament. Christmas tree should be placed in the lesser used room like in the study room where one can see the tree but it is not easily accessible. If you place the Christmas tree in the middle of a child’s play-space, it will attract little one and it tries to access it. If you are placing tree in the central location of your house you can use safety gates to make it inaccessible for the kids. After the whole preparations of Christmas take a tour of your home and see the things form your kids view point to make sure that you didn’t miss anything.